Two-Bedroom Vieux-MontrÃ©al by MC a property with a seasonal outdoor swimming pool and a fitness centre is located in MontrÃ©al 500 metres from Convention Centre Montreal a 6-minute walk from Underground City as well as 500 metres from Old Port of Montreal. Complimentary WiFi is provided throughout the property. 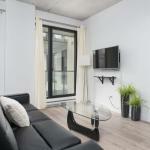 This air-conditioned apartment is equipped with a fully equipped kitchen a dining area and a cable flat-screen TV. The apartment also offers washing machine and a bathroom with a bath or shower. Notre Dame Basilica Montreal is a 6-minute walk from Two-Bedroom Vieux-MontrÃ©al by MC while Bell Centre is 900 metres from the property. The nearest airport is Montreal-Pierre Elliott Trudeau International Airport 16 km from the property.